Notice: all material presented herein is the author's copyrighted property. I grew up in Singapore and being Chinese I instantly became a big fan of Taiwanese baseball. So I travelled to Japan and Taiwan and noticed that much of Taiwan is built like Japan - except for the big, bright neon lights. 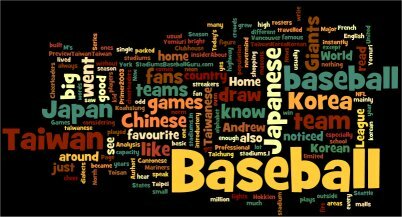 Baseball in Japan draw big crowds of around 50,000, especially the Yomiuri Giants. 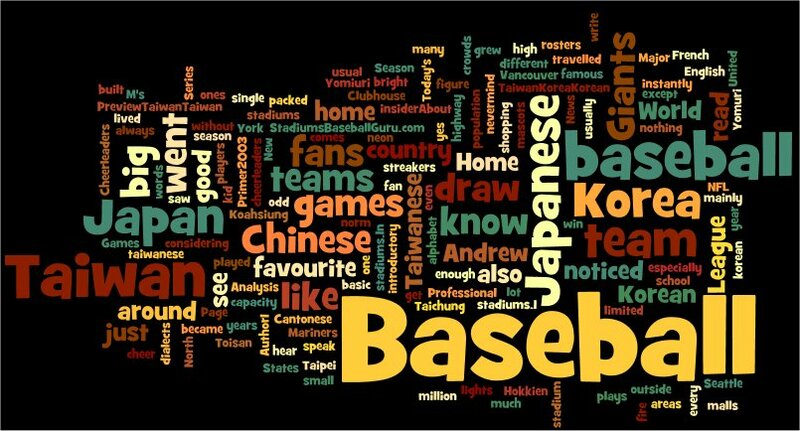 When I went to Taiwan, I noticed that the teams in the Chinese Professional Baseball League played in different areas of the country from Taichung to Koahsiung to Taipei - they did not have a home stadium. This way, many fans would get the opportunity to see the baseball players play. Games in Taiwan only draw about 5,000 fans and that would be a good figure. 1,000 is the norm considering how small Taiwan and their population is and the limited capacity of the local stadiums. In addition, I lived in South Korea for two years. I saw a lot of baseball games in Korea. Cheerleaders, yes cheerleaders (like those ones you see at NFL football games in the United States), cheer the home team on and fire up the crowd. You always have the usual mascots - without the odd streakers. Baseball stadiums are usually packed and teams draw around one million fans every single season. The each team plays 133 games a year. I also went to North Korea but there is nothing in that country - not even shopping malls and cafes nevermind baseball stadiums. I read, write and speak Cantonese, Toisan, Taiwanese, Hokkien (all Chinese dialects) and English. I know introductory Japanese and French. My Japanese is only good enough to read basic words and the rosters of the Japanese teams. I also know the Korean alphabet Hangul. My favourite Japanese baseball team is the Yomuri Giants. Being a kid and growing up outside Japan, all you hear about is the Giants. World famous just like the New York Yankees. But when it comes to Major League Baseball, my favourite team is the Seattle Mariners - mainly because they are just a highway down from Vancouver, where I went to high school. I don't know when the M's will win a World Series but one day they will stop that California Money from Rallyin' and put it in the Bronx Zoo. Read letters to the editor and other email sent to our Gurus.